The Action Express Cadillac squad held sway at the top of the Sebring 12 Hours leaderboard as the IMSA SportsCar Championship enduro hit the halfway mark. The team’s Whelen Engineering Cadillac DPi-V.R driven by Pipo Derani held the lead behind the safety car at the six-hour mark. Derani, who is teamed with Felipe Nasr and Eric Curran, led by just 1.5 seconds from the sister Mustang Sampling Cadillac of Joao Barbosa, Filipe Albuquerque and Brendon Hartley. The two Action Express cars had been on different refuelling cycles and had swapped the lead back and forth in the run-up to the halfway point. Neither stopped under the third safety car of the race, which allowed the team to establish itself in the top two positions. The safety car was deployed after Jonathan Bomarito crashed the #55 Mazda RT24-P out of second place at Turn 13 during a rain shower. The loss of two laps for the Mazda co-driven by Harry Tincknell and Olivier Pla meant that Cadillacs filled out the top five positions. Wayne Taylor Racing, winner of the Daytona 24 Hours IMSA opener in January, held third position in Jordan Taylor’s hands. The car he shares with Renger van der Zande and team newcomer Matthieu Vaxiviere had dropped down the order early in the race with a series of quick-fire stops to address a braking issue. Little time was lost because all were made behind the safety car after a wet track had precluded a green-flag start. The two JDC-Miller Motorsports Cadillacs held fourth and fifth positions in the hands of Simon Trummer and Juan Piedrahita respectively. 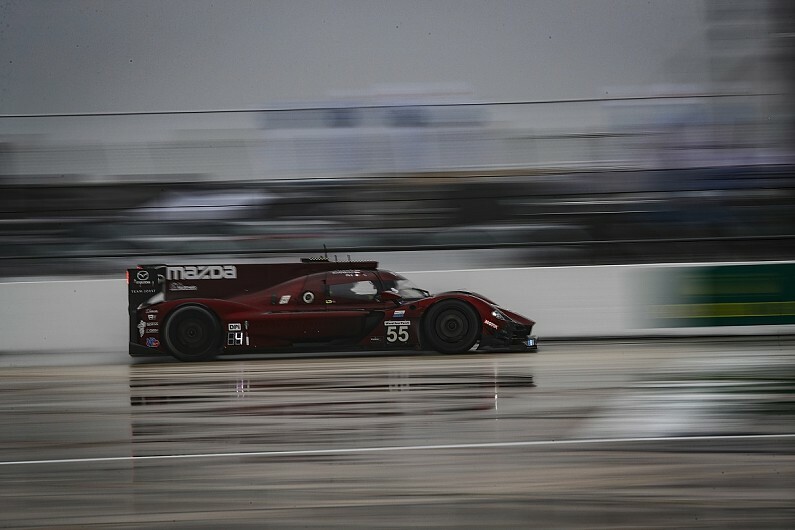 The second Mazda was just about to rejoin the race after lengthy repairs following an electrical fire that forced Timo Bernhard to pull over on the back straight in the third hour. The two Penske Racing Acura ARX-05s dropped off the lead lap after struggling in the wet conditions, the #6 car losing further time while bodywork issues were addressed. The Ganassi Ford squad led the GT Le Mans class with the #67 car shared by Richard Westbrook, Ryan Briscoe and Scott Dixon. The car had rarely been off the top of the leaderboard in the first half of the race, which included a stint of three hours and 20 minutes from Westbrook. The #3 Chevrolet Corvette C7.R driven by Antonio Garcia, Jan Magnussen and Mike Rockenfeller held second position after a quick turn around after the majority of the GTLM field headed for the pits during the safety car. Nine cars were on the lead lap in the GT Daytona class, with the Grasser Racing Lamborghini Huracan GT3 of Rik Breukers leading the way.